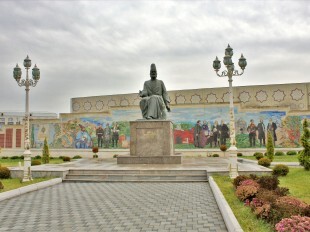 The Qakh region in northern Azerbaijan, close to the Georgian border, is ethnically diverse. Among its many minority groups are the Ingiloy who make up some 14 per cent of the Qakh population. In late November 2017, Visions travelled to Qakh’s village of Kurmuk to experience an unusual multi-faith religious celebration. Read on for Martha Lawry’s impressions. When I first heard about this event, I was perplexed. 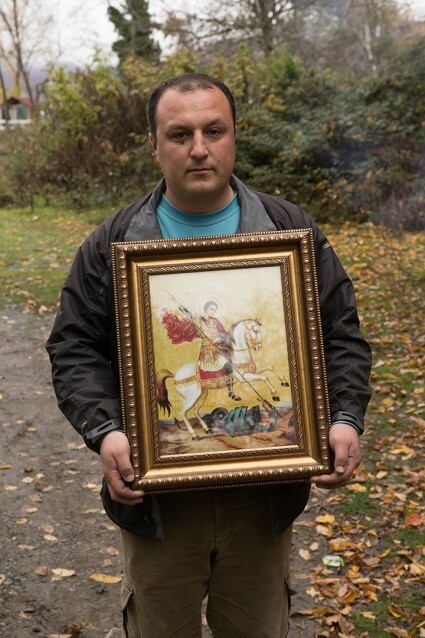 After all, it seemed to have two names: either Kurmukoba (the people’s holiday of the Kurmuk village) or Giorgoba (St George’s Day, traditionally celebrated in Georgia). The same holiday was held twice a year, on 6 May and 23 November. Both Azerbaijanis and Georgians claimed responsibility for it. Further, it was billed as a religious holiday, but was celebrated by Christians and Muslims together. I understood that the day’s events had something to do with hiking up a hill to a church with offerings, but in what religious style? As I flipped through photos of previous years’ events, I grew more confused. I saw rituals I would have previously identified as distinctly Orthodox Christian (lighting candles) or Muslim (sacrificing lambs or roosters). When I arrived in Qakh on the foggy morning of 23 November and began quizzing participants about the event, it turned out to be even more complex than I had imagined. The celebration began at the base of a hill in the village of Kurmuk. 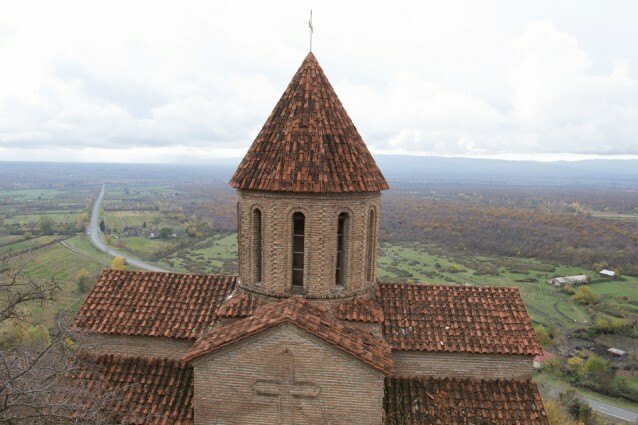 Atop the hill sits a red-roofed Albanian church that was built in stages from the 1st century onwards. In the 19th century, Tsarist Russia restored it to service as an Orthodox church and used it like a billboard high above the valley to encourage people to accept the new state religion. But the history of the church goes back further, and this is where the intrigue of the holiday begins. Some sources say the church was originally built in the 1st century over a site that had been revered in pre-Christian times as a pagan temple. Albanian villagers would hold seasonal sacrifices at this spot to start or stop rain. Indeed, the thick forest just below the church hides a menacing black cliff face on the hillside. On the day of my visit, people were huddled in front of the cliff lighting candles and sticking them to the rock face, so the smoke curled up into the frozen fog. I stopped for a moment to warm my hands in the glow. According to local legends, the steep cliff is really a gate with a dark cave inside. Just once a year after this holiday celebration on 23 November, in the blackest darkness before the dawn, the cliff splits open and a golden rooster flies out. The rooster alights on one person’s shoulder, instantly rendering him or her immortal. For a moment I was tempted to stay the night, but the cold and curiosity drove me onwards toward the church building to see where people would sacrifice the animals they had brought. Some locals claim that this pagan legend is the reason many people bring roosters to sacrifice on the holiday, carrying them uphill by the feet or in plastic bags. Before this holiday, I didn’t have a context for animal sacrifice in the Orthodox church and assumed this was a pagan or Muslim practice, but I later discovered that it does happen occasionally in parts of Greece and in Georgia, specifically on St George’s Day (see Kourbania on Orthodoxwiki.org). Aside from Christians sacrificing sheep and roosters, I was caught off guard by something else I had never observed: Muslims lighting thin beeswax candles as an act of worship. I was quickly rebuked for my ignorance, though. Fahima, a Muslim student who had come home from Ukraine to pray for her friends and sisters to get married, said, This is God’s house; it doesn’t matter if we’re Christian or Muslim. The main thing is God. Everything is in His hands. Some people buy extra candles and light one of them at home every Saturday for five or six weeks after the holiday in hopes that God will fulfil their desires. I was curious why people chose to attend the holiday. Some people did so quite sacrificially. 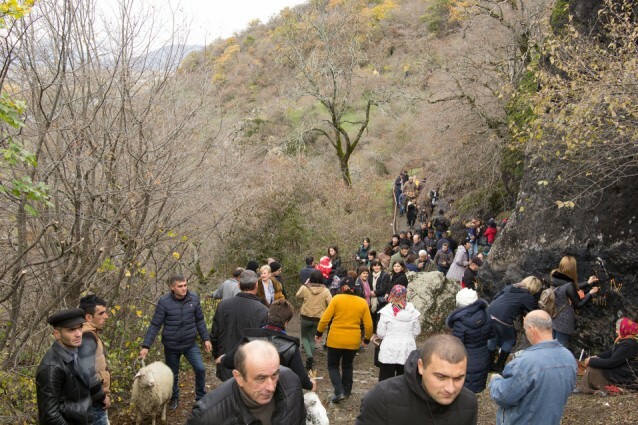 Azerbaijanis and Georgians alike chose to walk up the icy forest trail barefoot or to lead reluctant sheep along the route to consecrate them. As people told me their stories, I began to understand that this pilgrimage provided a sacred time and space for them to bring their issues before God. Some asked for babies, health, or success in examinations. Many people made sacrifices in the Old Testament capacity of “thank offerings:” giving back to God because their desires had already been granted. One young family who had entreated God for a child on this holiday years ago was carrying their toddler son so he could play on the hilltop as they had vowed. One boy was back to sacrifice a rooster because he had been granted his request from a previous year: acceptance into the Aviation University in Georgia. Maria, a Tsakhur housewife from another village in Qakh, said she came here several years ago to ask for healing in her joints. She was partially healed, so she came again this year to ask for more. I found her standing up on a high boulder in her socks. When I asked how she felt about making this pilgrimage to a church, she said, God is one. This is his house. We shouldn’t distinguish between Muslim or Georgian; we just have different prophets. For others, the holiday had the appeal of a family reunion. Many people kissed each other on the cheek along the trail, hugging and exchanging greetings as if they hadn’t seen one another for quite some time. A woman carrying a rooster up the hill, Lena, turned out to be half Georgian, half Azerbaijani. I asked her what religion she belonged to. They’re both the same to me, she said. 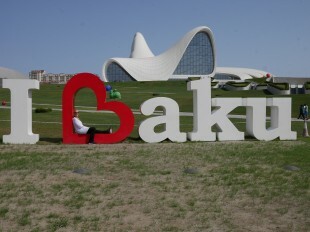 Azerbaijanis and Georgians are one friendly family. This holiday is for everyone. Georgians and Azerbaijanis visit each other’s homes today. They sacrifice their sheep and then have a big lunch together. Eventually a Georgian priest arrived. A crowd of people followed him uphill to the church, and assistants carried a framed icon before him. When he entered the church, a service began, and three nuns in black led the singing of traditional chants. 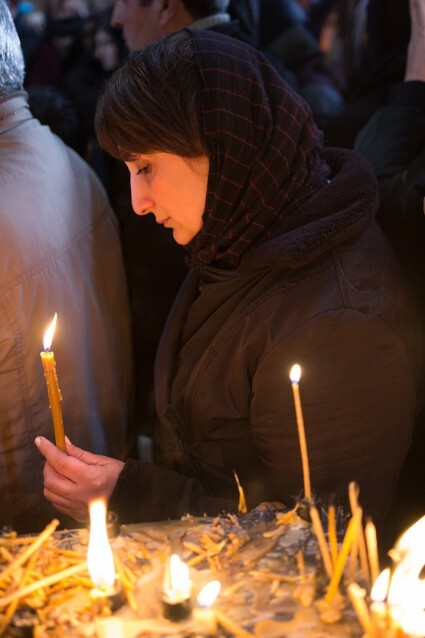 As I stood in the flickering candlelight admiring the music and watching the various ethnicities huddle together (I was also glad to be standing somewhere warm), a middle-aged Georgian man tentatively smiled at me and extended a candle my way. I took it, nodded to thank him and lit my candle at the metal rail, watching it flare up to join the light of all the others.